“All life is interrelated… somehow we’re caught in an inescapable network of mutuality tied in a single garment of destiny. Whatever affects one directly affects all indirectly. For some strange reason, I can never be what I ought to be until you are what you ought to be. You can never be what you ought to be until I am what I ought to be. This is the interrelated structure of reality.” – Martin Luther King, Jr. This past weekend, my wife and I visited a number of neighboring areas in search of a house to rent. In some communities, we found urban decay had rotted away once thriving neighborhoods. In others, we found urban renewal reclaiming dying buildings. I began to wonder, what happens from a values perspective as a community slowly dies. My search brought me to the story of Camden, New Jersey. Before the arrival of Europeans in the seventeenth century, the Lenni-Lenape Indians dominated the Delaware River valley. In 1626, The Dutch West India Company established Fort Nassau as a factorij (trading post) for the fur trade with native peoples. The fort became the first permanent European settlement in New Jersey, just five miles South of present-day Camden, New Jersey. As William Penn’s Quaker Colony grew across the Delaware River in Philadelphia, trade with Western New Jersey increased. In 1688, William Royden established a ferry service in modern-day Camden that transported cargo and people between the two banks of the river. Pioneer entrepreneurs established more ferry routes and settlements on the Eastern bank of the river grew. In 1773, Jacob Cooper developed 40 acres of land and named the town after the Earl of Camden, Charles Pratt. During the first half of the nineteenth century, Camden changed from a collection of quaint settlements to an industrialized town. Entrepreneurs established lumber companies, shingle factories, candle factories, sausage factories and glass factories to take advantage of Camden’s proximity to Philadelphia and transportation links to Southern New Jersey. In 1840, Camden had 3,371 inhabitants. By 1850, Camden was entering a 100-year golden age. Manufacturing grew from 80 factories in 1860 to 300 in 1939. The population grew from 20,000 in 1870 to 118,700 in 1939. The Campbell Soup Company was founded in Camden in 1869. The New York Shipbuilding Company launched in 1899. In 1901, The Victor Talking Machine Company (later RCA) opened its doors. During World War II, The New York Shipbuilding Company employed 35,000 people. It was the largest and most productive shipyard in the world. Close by, 42 Campbell’s factories churned out millions of cans of soup. RCA-Victor’s 18,000 employees made records and sound equipment. The Esterbrook Pen Company made 200 million pens a year. After the war, trouble began to brew in Camden. RCA relocated to the suburbs. The New York Shipbuilding Company closed. Campbell’s cut its workforce. White-collar jobs shifted to the suburbs and with them many higher-income wage earners. Blue collar jobs disappeared and with them, the livelihood of many of the African Americans and Puerto Ricans who had emigrated to the region during the boom. Unemployment skyrocketed and formerly productive workers found themselves on welfare. Cocaine arrived in the mid 1980s, turning the once thriving city into a war zone as gangs vied for territory in the lucrative drug trade. Camden is now one of the most dangerous cities in the Unites States. According to Neighborhood Scout, 1 in 39 residents is a victim of a violent crime whereas, 1 in 19 is a victim of a property crime. Close to 40% of the city lives below the poverty line. The high school graduation rate is an abysmal 47% and only 8% of residents over 25 hold a four-year degree. 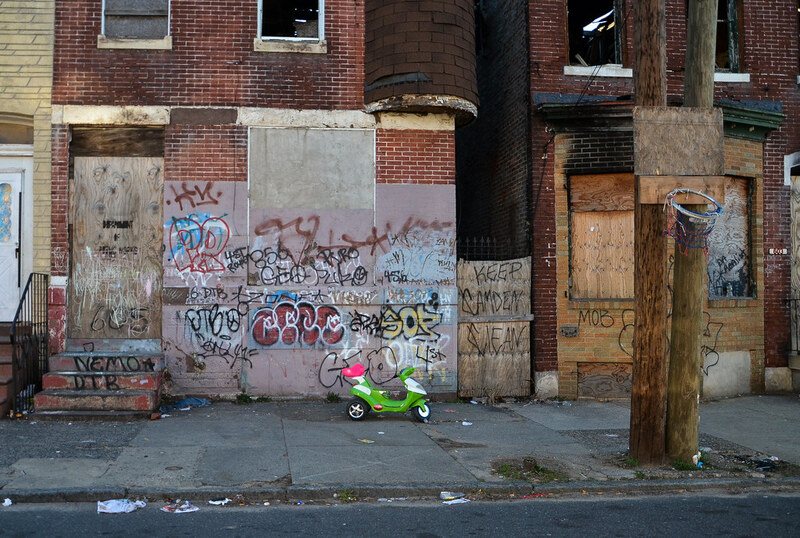 Camden is a prototypical example of urban decay. Deindustrialization causes high unemployment, depopulation, poverty and decaying physical infrastructure. A smaller tax base decreases a city’s ability to respond to the crisis. Reduced funding to critical services such as a police and fire departments further exacerbates the downward spiral. Most literature on urban decay focus on the economic attributes that accompany the process, but very little discuss the shifts in values that occur. Israeli Psychologist Sharon Schwartz’s Value Circumplex offers a useful tool with which to track values shifts during the history of Camden. In 1992, Schwartz published “Universals in the Content and Structure of Values: Theoretical Advances and Empirical Tests in 20 Countries,” which mapped out common values across cultures. Schwartz discovered that some values were complementary whereas others were opposites. In the following map, values that are closer to one another are more likely to be of similar importance to the same person, while values that are farther apart from one another are less likely to be similarly important. We can use the Schwartz Value Circumplex to map the value shifts that occurred during Camden’s history. By no means is this a quantitative analysis, but I do believe it does offer an interesting frame with which to view community change. When the Lenape controlled modern-day Camden, the collective community was placed above self-interest. Tribe members lived in communal dwellings and shared work and food. After Europeans displaced the Lenape, the values in Camden began to shift toward individual achievement and power. As the city grew larger its values mix likely became more balanced. Deindustrialization caused most high-income families to flee the city. Lower-income earners stayed and many joined welfare. As crime increased, some Camden residents became obsessed with security. For others who became addicts, hedonism (the pursuit of pleasure) was the primary motivator. Gangs obsessed with achievement and power. Urban decay is much more than vacant buildings. It is a breakdown of community values. Politicians and community builders would undoubtedly benefit from viewing their cities through the lens of values instead of focusing exclusively on economic and education measures. from the state of New Jersey for urban renewal. They spent almost $100MM on tourist attractions, including an impressive aquarium. These are very good points, thank you for the article. I see a changing value-landscape in my own city, Austin, Texas. Having been born and raised here, I used to see a more communal-value system in town. Now with the increased popularity and commercialization of the town, Austin has become more self-interested and competitive. Thanks again. Erwin, thanks for your comment. I hadn’t really thought much about the changing nature of cities until I began to think about what cities might have been like before urban decay set in. 50 years ago, people in the New York metropolitan area wouldn’t go to New York for shopping, they would actually head to Newark, NJ. How things have changed. Cities are dynamic as you’ve pointed out with your own city, Austin. In the past, cities were more about location but maybe in the future we will see more cities focusing on their values instead. Wouldn’t it be interesting for cities to tout their communal values as a selling point to prospective immigrants?